Youngest of the six siblings, Muhammad Ashfaqullah Khan was born on 22nd October 1900 in Shahjahanpur, Uttar Pradesh. His father was Shafiqur Rahman and his mother was Mazharunissa. His father worked in the police department. During school days of Ashfaqullah Mahatma Gandhi called for the Non-Cooperation Movement. This had a great influence on him and shaped him to become a freedom fighter. Ashfaqulla Khan used to write Urdu poems using the pen name of ‘Hasrat’. He was a friend of Ram Prasad Bismil who was a famous revolutionary of Shahjahanpur and a member of the Arya Samaj. In spite of their differences of faith, their common objective was to free India from the shackles of the British rule. It was on 8th August 1925 a meeting was organized by the revolutionaries in Shahjahanpur in which they decided to rob the Government treasury carried in the train to buy arms. So on 9th August, 1925 the group comprising of Ram Prasad Bismil, Ashfaqullah, Rajendra Lahiri, Thakur Roshan Singh, Sachindra Bakshi, Chandrashekar Azad, Keshab Chakravarthy, Banwari Lal, Mukundi Lal, Manmathnath Gupta robbed the train carrying government money in Kakori village. This event is known as the famous Kakori Train Robbery in history. For his active participation in the train robbery at Kakori (Lucknow), he was labeled as a terrorist by the British Government. Ram Prasad Bismil was arrested by the police on the morning of September 26, 1925. Ashfaqullah was still absconding. He went to Banaras from Bihar and started working in an engineering company. He worked there for 10 months. Ashfaqullah by then wanted to go abroad to study engineering which would further help him in the freedom struggle. He went to Delhi for this purpose and trusted one of his Pathan friends who pretended to help him but in turn handed him over to the police. Ashfaqullah was confined in the Faizabad jail. His brother Riyasatullah was his counsel who fought the case. The case for the Kakori train dacoit ended with the awarding of the death sentence to Ram Prasad Bismil, Ashfaqullah Khan, Rajendra Lahiri and Roshan. The others were given life sentences. It is reported when asked for his last will before execution Ashfaqullah said” No desire is left except one that someone may put a little soil of my motherland in my winding sheet”. 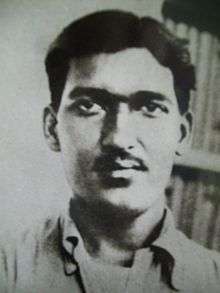 Ashfaqulla Khan was hanged on December 19, 1927.